My very first tattoo was done on my 18th birthday in 2005...[it is] a black dragon with kanji above it. About a year letter I had a koi fish done on my calf...both of these tattoos were just drawings I had found. In 2006 I started working on my rib piece and in 2007 I got together with John from A Different Drummer here in Wichita Falls (he is now at the Lawton, OK location), and the two of us collaborated on bringing the rib piece together. Once the drawing was to our satisfaction, it took a little over 2 months of 3-4 hour sittings weekly until the tattoo was complete. 16-plus hours and worth every minute! Both pieces are marvelously done. 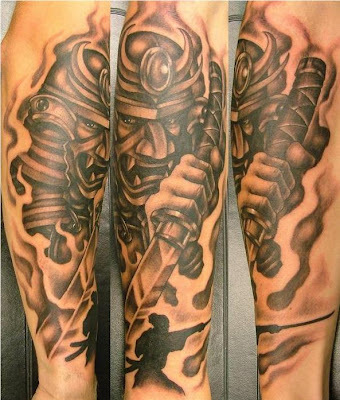 Thanks to Dean for sharing his work with us here on Tattoosday! 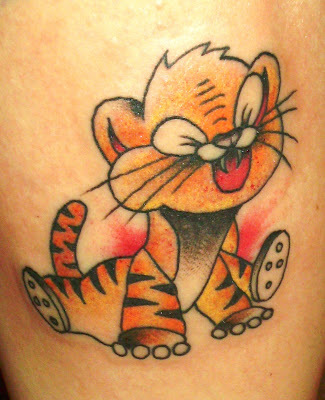 And a hearty thank you, as well, to Tammy, for being a cool mom, sharing her pride in her son's amazing body art! Last summer, my wife Melanie met Tammy on the staff message board of their company's website, where she and other employees across the country can exchange ideas and feedback. As a leader for Weight Watchers, Melanie often comes across members and co-workers who have used tattoos for inspiration and to mark milestones. When talking to Tammy, a leader in Texas, she learned that she was inked, as well. She sent her the link to Tattoosday, and Tammy sent us photos of a few of her eleven tattoos. "I got my very first [tattoo] when I was 21 in Virginia while getting a tattoo for my younger brother but I didn't get another for several years at which time I had my uncle in Arkansas place a rose under the butterfly I had done first. It is old and faded but holds so much meaning to me as my uncle passed away in his 40s about 5 years ago so I have him with me at all times...I then waited a couple more years and had a dolphin put on my left ankle as a reminder of a trip we had made to Florida. About a year later an apprentice in Shreveport added an ankle wave under the dolphin. I then took a long break from tattoos and the rest have all been done in the last 5 years here in Wichita Falls, Texas, with the exception of the tribal butterfly [seen below]. 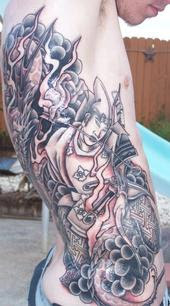 I had it done in Lawton, Oklahoma, when my son was getting his rib piece finished up [a subject of a later post]. And a Pisspot with my husbands name [pictured left]. My husband just retired with 26 years in the service and was AMMO-I always wanted this but was never brave enough nor skinny enough for that so called "tramp stamp"... it actually looks awesome although this picture is a little blurry. Most of Tammy's work was done at A Different Drummer Tattoo Studio in Wichita Falls. Thanks to Tammy for sharing some of her photos with us here on Tattoosday! 12:10 PM. Rather than wander in search of ink, I am trying something else. Staying put, here in front of the Amtrak Departures board in Penn Station, and seeing what walks to me. I have only successfully met 2 of the inked nation in the last 27 days, and I'd like to resume posting more regularly. I figure, sooner or later, this wintry drought will end. 12:20 A woman walks by with two interlinking gray hearts behind her right ear. I hesitate and decide not to approach her as she walks by. The tattoo didn't speak to me. 12:35 Still nothing. 5 minutes left in my little experiment. 12:36 Ed Hardy baseball cap. 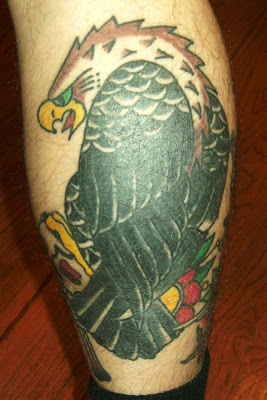 Last month I featured a leg tattoo belonging to Daniel, who was visiting from Australia. 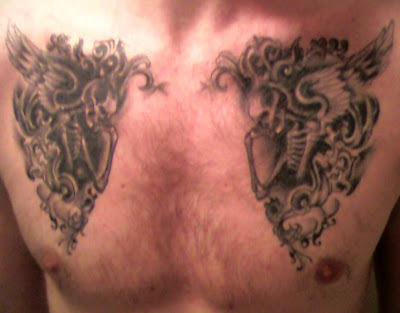 At the time he alluded to the fact that he had a pretty cool chest piece, as well. Understandably, he wasn't about to whip his shirt off in Penn Station in December. The inspiration from this art, also related to the band Machine Head, can be seen on their main web page here. Like his other tattoo featured previously, these pieces were done by Jonny at Abandoned Art in the Wanneroo section of Perth, Australia. Daniel says they took two sittings and about five hours to complete. Thanks to Daniel for following up with this photo here on Tattoosday! 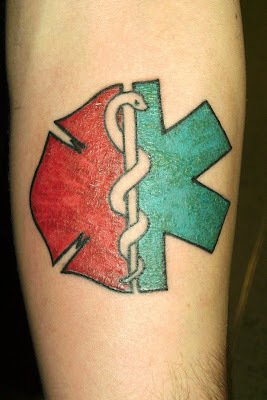 Eric explained that he is a volunteer firefighter and EMT out on Long Island, and he wanted a tattoo to represent both sides of his service to his community. This was done by Debbie at Skin Deep Tattoo in Levittown, New York. Work from this shop has appeared previously on our site here. Thanks to Eric for sharing his new tattoo with us here on Tattoosday! 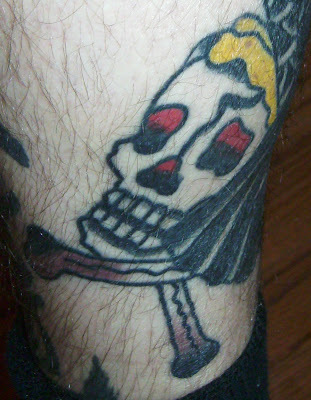 Although we're not a fan submission site, we'll occasionally post tattoos from fans with interesting work to share. It often helps us through the lean months when most ink is hibernating in the colder climates. 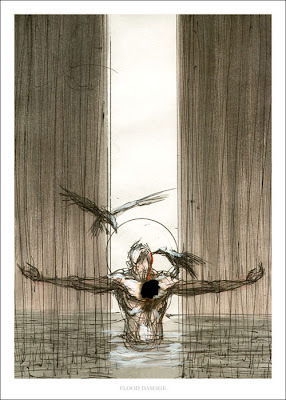 "The piece is [based on work] by Derek Hess and it's called 'Flood Damage'. I got it in April of '09 after 2008 was one of the worst years of my young life (I'm 25 now) to mark the fact that as much as I was flooded with bad things in '08, I was moving on. It was done by a..."Low" [who recently left] Lucky Draw Tattoos in Kennesaw, Georgia. 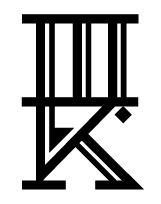 I got it tattooed on the outer portion of my right thigh. The piece took just about 3 hours...I absolutely love it. Everytime...I get a chance to look at it, I remember that I'm not the same guy anymore and that I've moved on with my life." 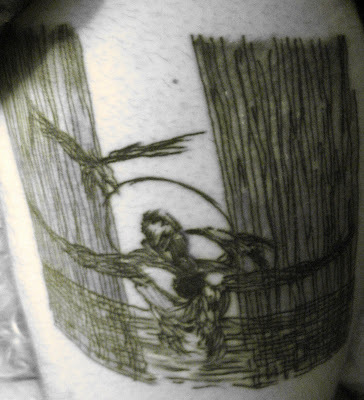 We featured a tattoo based on the work of Derek Hess previously here on Tattoosday. 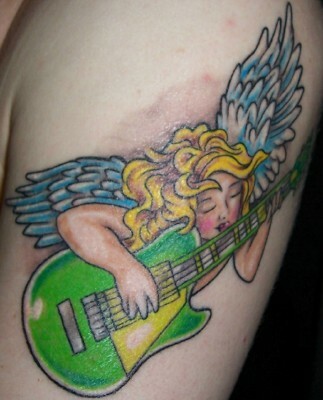 Jeremy also apologized for the fact that the photo is in black and white, but there is color in the tattoo. His camera on his phone, however, would not shoot in color. Thanks again to Jeremy for sharing his work with us here on Tattoosday! We here at Tattoosday have been biding our time over the past week, a seven-day drought of posts to match the scarcity of ink visible in the Frozen Apple of a brittle New York winter. So today I am posting work not spotted in the streets, but work on the legs of Pete, who meticulously crafted this lovely piece on my upper back last year. Both tattoos were crafted by old-school Brooklyn tattoo artist Steve Delgado. I thank Pete for his outstanding work, and for sharing some of his tattoos with us here on Tattoosday! This is my fourth tattoo and the one I pondered the least. 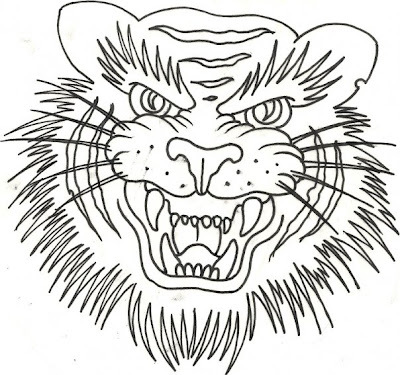 If you've been reading, you know the premise: 2010 marks the Year of the Tiger in the Chinese Zodiac, and when I heard that Thicker Than Water Tattoo Studio, a new shop on the Lower East Side, was doing a special tiger-inking event for the new year, I grew interested. When I saw the flash drawn for the event, I knew I wanted one. And, after talking with artist Shon Lindauer, he drew up a special one for me, and the rest was history. Because he wanted to put more time into it, we scheduled the session for Sunday, after the Saturday of the Tiger, and did it on the third, happy half-birthday to me. So why a Tiger? Aside from the topical (thank heavens it wasn't year of the Rabbit), I can say I have connections to tigers. My favorite baseball team is Detroit, and I spent four years at Occidental College in L.A., home of the Tigers. In that sense, since 1985, I have been part-Tiger. 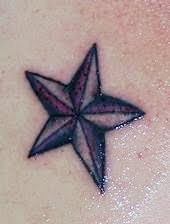 But like most tattoos, meanings grow and new meanings emerge. 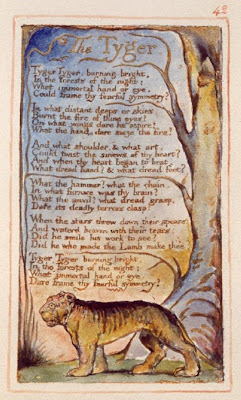 I am a poet, and what writer is worth their salt if they heard the word tiger and didn't think of William Blake? And so I strode onto Avenue B with a sense of purpose, and a desire to go under the needle again. And the snow flurried but I did not feel the cold. I knew, soon enough, that I would feel the fire from the tattoo machine. Lucky me, Shon worked with mechanical precision, and I was his first client that got to experience his new custom shader, built by Seth Ciferri. The tattoo was done in under two and a half hours, and the reviews have been overwhelmingly positive. I love it. Thanks to Shon Lindauer for his hard work on this awesome tattoo and the staff at Thicker than Water for welcoming me into their shop. 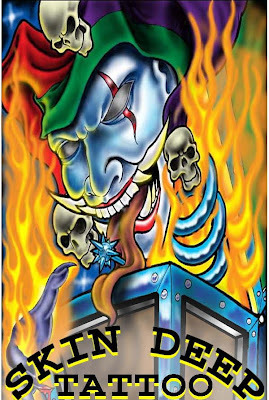 Happy New Year from all of us here at Tattoosday! 2009 was a banner year for us as we reached an even broader audience, racking up 317,000 hits, almost triple what we had seen here in 2008. We're looking forward to welcoming even more visitors in the coming year. 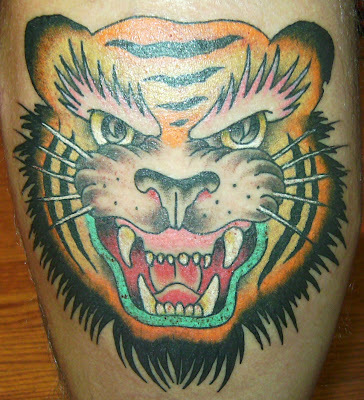 Yesterday, I paid a little visit to Thicker Than Water Tattoo Studio on the Lower East Side where, as I mentioned in the previous post, the good folks were inking tiger tattoos to celebrate the upcoming Year of the Tiger. 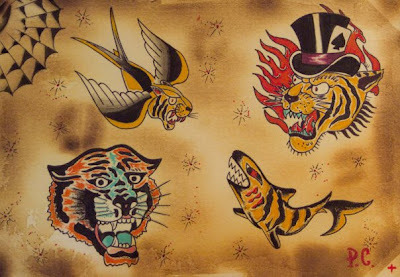 At $50 a pop for these tiger specials, the artists had a steady stream of clients asking to get their tiger stripes for the upcoming year. Despite frigid temperatures with single-digit wind chills, clients were still drifting in when I left later in the evening. Jennifer was born in the Year of the Tiger, so it seemed appropriate to take advantage of this super deal that the artists at Thicker Than Water were offering. 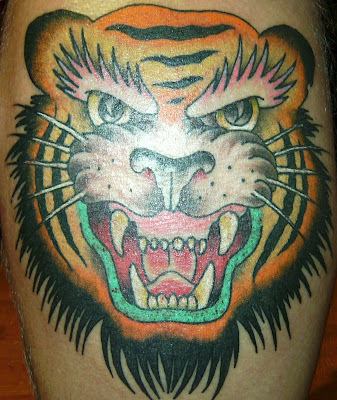 As I bundled up to brace myself against the cold, customers were drifting in from Avenue B and a young lady checked out the flash to decide on another tiger tattoo. With a few more hours to go, it looked like the artists were going to be busy. 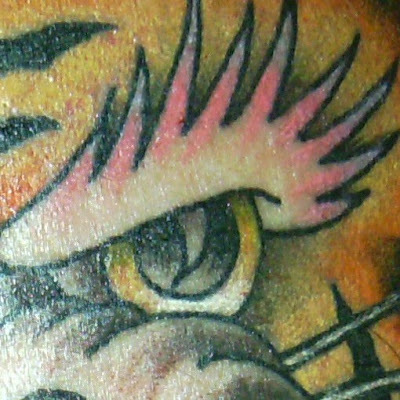 Happy New Year and thanks for continuing to visit us here on Tattoosday.